Nevare Burvelle is the second son of the New Lord Burvelle of the East. Destined and trained from birth to be a soldier, it's all he knows. His one dream is to do his duty and be a good soldier. 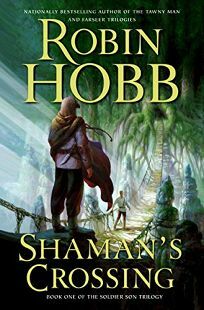 In this captivating tale of a world where honor, obedience and a thoughtless adherence to rules have prevailed for generations, Hobb (The Farseer and Tawny Man trilogies) pits Nevare's beliefs against an unseen, unknown chaos that will transform his world. Nevare, through no fault of his own, becomes an agent of change and a pawn in the magical struggle of the Plainspeople against the hide-bound and selfishly destructive Gernians. Hobb excels at constructing worlds and people who are fully fleshed out. The pace is more leisurely than in previous books, but the build-up of suspense reverberates throughout the pages, pulling the reader relentlessly forward. Here is a master storyteller out to make a point and succeeding beautifully.